Welcome to Goodyear Tire & Auto Service, the premier Santa Cruz Hummer service and repair shop. Goodyear Tire & Auto Service is a full-service auto repair shop – we offer services ranging from manufacturer recommended maintenance to advanced diagnostics and repairs. Our nationally ASE certified mechanics will get your Hummer back on the road, and, usually, we can do it the same day. 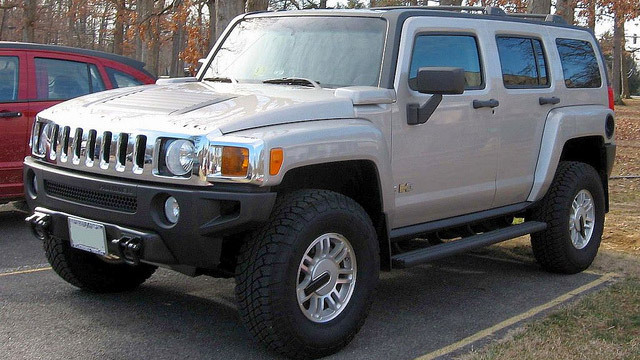 Hummer was originally designed for military use, which makes it the ultimate off-road vehicle. Even though it was designed to withstand rigors of combat, it still requires regular maintenance. To keep your Hummer reliable and at the top of its game, we recommend following factory recommended maintenance schedule, as well as providing your Hummer with regular oil service. If you have any concerns about your Hummer, bring it to us for a professional checkup and diagnostics. Some problems may be serious - H3 is known to have problems with leaking valves, engine running rough, and an occasional cylinder head failure – so bring your vehicle to Goodyear Tire & Auto Service, we will diagnose the problem and help you decide on the best course of action. Naturally, being a full service Santa Cruz auto repair shop, Goodyear Tire & Auto Service can handle many other Hummer maintenance, service and repair issues, including: AC recharge, brake pad replacement, brake repair, AC repair, shocks, struts, suspension problems, transmission problems, oil leaks, fuel pump replacement, water pump repair/replacement, electric system diagnosis, coolant leaks, as well as check engine light diagnosis and most other services and repairs your Hummer may require. Whether your Hummer needs an oil change or major repairs, our friendly staff will be happy to help. Give us a call to schedule an appointment, or make an appointment online.